Hello everybody! This blog is all about watches! I intend to use it to post all kind of info about watches (new releases, technical info, history, collections, repair, links, and lots more). For it to work, i need your sugestions and comments! Thank you. The Precista 300 follows the tradition of paying homage to military and military-style wristwatches of the past, in this case it follows and improves on the specification of British Ministry of Defence Standard 66-4, Part 1 Issue 2. This revision is dated 1 January 1971. This is arguably the most popular military dive watch today and good examples are keenly sought and command a high price. This edition bearing the Precista name has been faithfully manufactured to the original specification, improving on it where appropriate. The most significant improvement is the addition of an anti-magnetic movement cover, movement holder and soft iron dial giving the watch anti-magnetic resistance to 80,000 A/m (Amp metres), the same as modern day IWC and Sinn watches. This has increased the thickness of the watch by 3mm over the original. Solid stainless steel case with brushed steel sides, polished top and back. Unidirectional bezel with luminous numbers in the bezel insert sealed with hardened acrylic. Screw back and screw down crown; the crown assembly is identical to that employed in the "Dreadnought" and has been tested to 2000 metres. Domed acrylic crystal in keeping with the original design. The dial is soft iron anti-magnetic and the polished steel sword hands are filled with Super Luminova, as are the indices. Each watch has its own unique serial number, which also identifies the date of manufacture, engraved on the case back. 40mm diameter across the bezel and 46.6mm to the tip of the signed crown. 47mm lug tip to lug tip and 14.3mm thick tot he top of the domed crystal. Lug spacing is 20mm and the watch head without strap weighs 90 grammes. ETA 25 jewel automatic, calibre 2824-2 (standard). Supplied in box with 12 months guarantee and choice of Time Factors Aviator, Rally or Carbon strap. Also supplied with a spare crystal and tube of Polywatch. 1993 • Bruno Belamich and Carlos A. Rosillo, two boyhood friends, joined forces for one of the most beautiful adventures in watchmaking of the late 20th century. They decided to launch a simple idea: “function shapes form.” Efficiency, legibility, and reliability were the three words that would define the Bell & Ross brand. Indisputably the most brilliant idea of the two young inventors – when they started out as watchmakers – was, from the start, to closely collaborate with Sinn, a highly reputable manufacture. Sinn specialised in the production of dashboard meters. Space One and Hydro were the fruit of this collaboration. The second key idea was to get the adventure off the ground by giving the brand a strong identity as an efficient chronometer, to meet the needs of the most exacting user. Immediately adopted by NATO and the Air Force, Bell and Ross also found takers within the French security service’s bomb disposal squad. To make the point, they created Hydromax, the most reliable watch in the world, for deep underwater work, with the world abyssal record for water resistance to 11,000 meters. They also managed to restore with great success the taste for pilot watches that had flourished in the 50s and 60s, but which had since been forgotten. 1994 • Bell & Ross re-issued the Space 1, the first automatic chronometer to be worn in space, by the German astronaut Reinhart Furrer on the Spacelab mission in 1983. 1996 • Creation of the Bell & Ross Bomb Disposal Type, ordered for use by the bomb disposal unit of the French Security Services. The watch had an anti-magnetic, A-magnetic case, and the legibility, reliability and precision to meet the very special needs and constraints of bomb disposal operations. 1997 • World water resistance record awarded to Bell & Ross for the Hydro Challenger (11,000 meters in Guinness Book of Records). 1998 • The Space 3 chronograph brought together all of Bell & Ross’ know how. It is equipped with a screwed down, telescopic retractable winding crown, known as the T-Crown system, which enabled the winding crown to be fully incorporated within the depth of the case. Chanel Horlogerie took a shareholding in the capital of Bell and Ross. 2000 • Second increase in the Chanel stake, but Bell & Ross retained a majority holding. 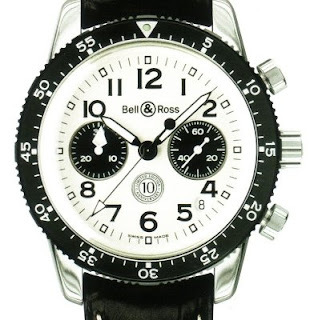 2001 • Bell & Ross unveiled the modern multifunction men’s watch Function, combining classic style with the modern movement’s analog and digital display. 2002 • First jumping hour hand watch with power reserve indicator. The Vintage 123 Heure Sautante was the fruit of cooperation between Bell and Ross and the Swiss master watchcraftsman Vincent Calabrese. Equipped with an automatic movement, this grande complication offered an easy, original way to tell the time. End of the collaboration with Sinn and autonomous production at Chatelain in Chaux des Fonds. 2003 • Bell & Ross paid timely homage to the ladies with the Mystery Diamond, that magically concealed the secret mystery of its weightlessness: A diamond floats and turns between the crystal and the dial to show the time. 2005 • Introduction of the BR 01 Instrument, the wristwatch born of an airplane clock. The X-33 is used by NASA and many space agencies for in-flight mission requirements. It is issued as one of four watch models approved by NASA for mission use. The others are the original Omega Speedmaster Professional, a Casio G-shock, and a Timex Datalink. The original mechanical Speedmaster Professional remains the only watch authorized for use during EVA "spacewalks." The X-33 is most often seen worn on the black kevlar strap, though the titanium bracelet appears sometimes as well. Rarely it can also bee seen worn on a one-piece white velcro strap similar to (or the same as?) that used to fit around the spacesuit. The watch is issued to NASA astronauts and is often worn on the ground as well to build familiarity with the interface and operation of the watch, much like the astronauts of the Apollo program in the 1960’s and ’70s wore their NASA-issued Speedmaster Professionals on the ground. In the summer of 2006 Omega announced that the Speedmaster Professional X-33 would be discontinued for regular retail sale, but shortly thereafter it was determined that the X-33 would still remain available to space agencies like NASA and to military aviators under under the Military Pilot Program. While Omega never provided any definitive reasons for the cancellation, there was much speculation (as always!) among enthusiasts and collectors. Its namesake NASA X-33 program had already been cancelled in awkward embarassment years previously, and unfortunately for Omega it was probably getting increasingly hard to maintain credibility selling a watch bearing the same tainted name. Moreover, despite its aviation and space pedigrees the X-33 was sadly never a blockbuster seller in the retail market, with pricing being perhaps among the biggest reasons. At its price point (MSRP about US$3400) it was relatively expensive for a sport/tool watch when similarly featured models from the competitors like the Casio G-Shock could be had at a fraction of the price. And though technically superior and well-matched to its intended flight/space applications, quartz technology can be a hard to sell at those prices. Though very functional it lacks the prestige and nostalgic tradition of a mechanical movement, something consumers who would spend such a sum on watches still seem to want in a "luxury" watch. 1884 · In St. Imier, in the Jura mountains of Switzerland, Leon Breitling opens a workshop specializing in making chronographs and precision counters for scientific and industrial purposes. 1892 · In response to his company's significant growth, Leon Breitling relocates in La Chaux-de-Fonds, the center of Swiss watchmaking in those days. 1914 · On the demise of Leon Breitling, his son Gaston takes over the firm. 1915 · Gaston Breitling creates the first wristwatch chronograph and subsequently provides pilots with their first wrist instruments. 1923 · Breitling develops the first independent chronograph pushpiece. Start and return-to-zero functions had previously been controlled using the winding-crown. 1932 · Gaston's son, Willy Breitling, takes the helm of the family firm. 1934 · Breitling develops the second return-to-zero pushpiece. This invention, making it possible to measure several successive short times with an add function using the first pushpiece, gives the wrist chronograph its definitive form. 1936 · Breitling becomes the official supplier to the Royal Air Force. This marks the start of a longstanding record of cooperation with international aviation. 1942 · Breitling launches the Chronomat, the first chronograph to be fitted with a circular slide rule. In parallel, the company broadens its professional clientele to include the American armed forces. 1952 · Breitling creates the Navitimer, a wrist instrument equipped with the famous "navigation computer" capable of handling all calculations called for by a flight plan. This super chronograph quickly becomes a firm favourite among pilots around the globe. By this stage, Breitling is already supplying the major international airlines with cockpit clocks. 1962 · Astronaut Scott Carpenter wears the Cosmonaute Chronograph on his wrist during his orbital flight aboard the Aurora 7 space capsule. 1969 · Breitling invents the selfwinding chronograph movement, in cooperation with Buren and Heuer-Leonidas. This technical feat represents a major breakthrough for the entire Swiss watch industry. 1979 · Ernest Schneider - a pilot, watch manufacturer and microelectronics specialist - takes over the Breitling brand from the founder's grandson, Willy Breitling. 1984 · Breitling launches the Chronomat, in close cooperation with the Frecce Tricolori elite flight team. With its sturdy case and famous bezel with rider tabs, the Chronomat marks the return of the mechanical chronograph and quickly becomes the best-selling line in the Breitling collection, a position it has held ever since. 1985 · The Aerospace, an innovative multifunction electronic chronograph crafted in titanium immediately appeals to many pilots. 1995 · Breitling presents the Emergency, a multifunction instrument watch with built-in micro-transmitter broadcasting on the 121.5 MHz aircraft emergency frequency. 1999 · The "all-chronometer" challenge: as the crowning touch to a century of watchmaking excellence, Breitling has set itself the ambitious goal of submitting its entire product range to the Swiss Official Chronometer Testing Institute. A world first among major watch brands. 2000 · Breitling inaugurates its new headquarters in Grenchen, Switzerland, made up of an ultra-modern administrative building and a state-of-the-art production unit where Breitling chronometers are assembled in optimal conditions. 2001 · With the introduction of SuperQuartz&tm;, Breitling provides movements ten times more accurate than standard quartz. The brand thereby asserts itself as a benchmark in the field of quartz: its electronic movements are the only ones on the market able to meet the COSC requirements. 2002 · Breitling Chronometrie, a unit specializing in the making of mechanical chronograph movements, is established in La Chaux-de-Fonds, the town where Leon Breitling opened his first chronograph factory 110 years earlier. Check this videos on YouTube. They are worth it! Just do a "copy-past". An interesting fact you may or may not know: International Watch Company (IWC) is possibly the only major Swiss watch company whose founder was an American! During the 1860's, three manufacturers dominated the American watch industry: Elgin, Howard and Waltham. Combined, these firms produced upwards of 100,000 pocket watches. Times were changing in the industry as pocket watches went from being a status symbol that only the wealthiest individuals could afford, to an everyday item available to the middle class. As a result, production methods had to be improved; for example, most parts for watches were still being made by hand. Costs were also high because the pool of available, qualified watchmakers was relatively small. In Boston, Massachusetts, Florentine Ariosto Jones, who had worked in the American watch industry for a number of years, keenly observed the failure of Aaron Lufkin Dennison, a leader in the watch business, whose efforts to move production to Switzerland to benefit from lower wages and Swiss watchmaking know-how, failed miserably. Undaunted, Jones took over the failed enterprise and soon set up his own company in Switzerland. His plan was to assemble watches in Switzerland and import them into the United States, hence the name International Watch Company. Fortuitously, Jones made the acquaintance of one Johann Heinrich Moser, a watchmaker whose hometown of Schaffhausen was conveniently located near the Rhine. Following Moser's advice, a dam was built in order to harness the mighty river and generate hydro-power to drive the machines used in manufacturing facilities throughout Schaffhausen. A watch factory was built in Schaffhausen to take advantage of the cheap hydro-power and production commenced in 1868. Despite the company's unique business plan, the enterprise was doomed from the start. For one thing, Jones had trouble selling the watches in America, due to a high tariff on imported finished watches. An even worse problem: Jones was undercapitalized and encountered technical problems with the machines. By 1875, he was scrambling to find new investors, amid allegations by disgruntled stockholders that the company was on the verge of collapse. Inevitably, the company filed for bankruptcy and Jones was forced to relinquish control of his company. A Swiss consortium acquired IWC's shares and put another American, Frederick Seeland, at its helm. Although the company's fortunes improved somewhat, the improvement was not deemed sufficient enough. As a result, the company was put up for sale again. This time, one of IWC's stockholders, Johannes Raschenbach-Vogel, bought the company at auction for 280,000 francs. Technical achievements and increased sales soon followed with the production of the first pocket watches with digital time indication, as well as development of the famous Calibre 52 movement, which at the time was quite revolutionary in its concept and construction. Although the company experienced significant growth, following World War I, the company's fortunes again hit rock bottom under the proprietorship of Ernst Homberger-Rauschenbach. Fortunately, a major modernization effort paid off when the advent of World War II resulted in increased military demand. It was thus during World War II that IWC created the first oversize anti-magnetic pilot's watch, followed by the famous Mark X, featuring its new in-house movement, Calibre 83. In 1944, IWC had a close call when the Allies mistakenly bombed Schaffhausen. As luck would have it, the factory narrowly escaped destruction. In the aftermath of the war, International Watch Company lived up to its name and became a company of international scope. Exports to the United States increased and the brand became best known for its specialty watches, such as the Mark XI and Ingenieur - the first automatic IWC with a soft-iron inner case that protected the movement against magnetic fields - as well as for its elegant dress watches. Needless to say, vintage IWC's from the 1940's and 50's are highly collectible today and in great demand, as they are somewhat under-priced compared to other high-end watch brands of that era. In closing, the company's philosophy is best summed up by IWC's current CEO, Michael Sarp, who recently stated: "We shall produce watches of the highest quality with unique technical and design characteristics and thus continue to experience the pleasures of innovation." If you should have an opportunity to examine an IWC, you will quickly realize that Mr. Sarp speaks the truth. The Quartz Crisis also known as the Swiss Watchmakers’ Crisis of the 1970’s and sometimes, perhaps euphemistically, referred to as the Quartz Revolution, was a period in time in the 1970s and early 1980s which coincided with the advent of quartz oscillator technology watches, a general economic down-turn and, the low point of the Swiss watch industry which chose to remain focused on traditional mechanical watch technology rather than embrace the new quartz watch technology. During World War II, Swiss neutrality permitted the watch industry to continue making consumer time keeping apparatus while the major nations of the world shifted timing apparatus production to timing devises for military ordnance. As a result, the Swiss watch Industry enjoyed a well protected monopoly. The industry prospered in the absence of any real competition. Thus, prior to the 1970s, the Swiss watch industry had 90% of the world watch market. But when a new quartz technology was developed by Swiss Nationals and offered to the industry, Swiss manufacturers refused to embrace the technology. Others, outside of Switzerland, however, saw the advantage and developed the technology. The first mass-produced quartz watches with analog display and integrated circuit were introduced in 1970. By 1978 quartz watches overtook mechanical watches in popularity, plunging the Swiss watch industry into crisis. This period of time was marked by a lack of innovation in Switzerland at the same time that the watch making industries of other nations were taking full advantage of emerging technologies, specifically, quartz watch technology, hence the term Quartz Crisis. Ironically, the very technology which caused so much of the turmoil in the Swiss watch industry was pioneered by Swiss Nationals but rejected by the more conservative and tradition oriented watch industry. As a result of the economic turmoil that ensued, many once profitable and famous Swiss watch brands became insolvent and/or disappeared. The period of time completely upset the Swiss watch industry both economically and psychologically. The Swiss lost market share to the less expensive quartz watches produced outside of Switzerland. During the 1970s and early 1980s, technological upheavals i.e. the appearance of the quartz technology, and an otherwise difficult economic situation resulted in a reduction in the size of the Swiss watch industry. The number of employees fell from some 90,000 in 1970 to a little over 30,000 by 1984, while the number of companies decreased from about 1,600 in 1970 to about 600. However, as currently re-established the Swiss watch industry is vastly improved, producing watches in the higher ranges, mostly mechanical watches. By 1981, crisis reached a critical point. In 1982, the first Swatch prototypes were launched. The Swatch would be instrumental in reviving the Swiss watch industry. Swatch was originally intended to re-capture entry level market share lost by Swiss manufacturers during the aggressive growth of Japanese companies such as Seiko in the 1960s and 1970s, and to re-popularize analog watches at a time when digital watches had achieved wide popularity. The launch of the new Swatch brand in 1983 was marked by bold new styling and design. The quartz watch was redesigned for manufacturing efficiency and fewer parts. This combination of marketing and manufacturing expertise restored Switzerland as a major player in the world wristwatch market. Synthetic materials were used for the watch cases as well as a new ultra-sonic welding process and the assembly technology. The number of components was reduced from some 100 to 51, with no loss of accuracy. Hayek, merged SSIH and ASUAG, a holding company that controlled manufacturers of movement blanks, assortments and electronic components for the entire Swiss watch industry, and gave a new bill of health to all brands concerned and gave rise to what would become the Swatch Group. The Quartz Crisis was introduced as “the Second Technological Crisis” thereby implying that there was a first technological crisis. The Quartz Crisis was, indeed, the second time the Swiss watch making industry fell into crisis. The first crisis, known as the Technological Crisis, arose in 1876 and coincided with the American Centennial Exhibition held in Philadelphia. At this event, American watchmakers showed off the fruits of their industrialized watch making factories, quite to the dismay of Swiss watchmakers in attendance. Most notable, Jacques David, an engineer and later a Director of the Longines Company was in attendance. He reported on his findings and the disparity of the industrial technology among the U.S. and Switzerland. David, discovered, the technological advancements made by the fledgling American watch industry. Whereas Swiss manufacture was stammered by its piecemeal production system, which was the most widespread form of production, the American watch producers brought together the entire production of watches under one roof. The American System, as it came to be known, employed standardized, machine-made parts along with improved machines and tools. They thus, could reach a generally higher level of precision. Their chronometers were better than best produced during this nadir of Swiss production. "[t]ere was no innovation, no new development, and when I pushed them to start doing new production, everybody started shouting... I said I was not going to deliver any more of my movements unless they try to do their own production...Otherwise the Swiss watch industry will suffer exactly the same problems it had before and it will go down." This lack of innovation, essentially quartz technology has been at a standstill for approximately 30 years, ensures that the chronometer watch remains a prestigious item, produced only by the more exclusive watch brands. A million such watches are produced each year (most of which are mechanical) and comply to various time keeping regulations imposed by the COSC. The quartz chronometer watches contain 3rd generation quartz ebauches (developed in the 1970's), but this technology is still generally unavailable to the to the average consumer. No advances have been made towards a 4th or 5th generation quartz watch, thus keeping time a precious (and expensive) commodity. As the wristwatch evolved in the 20th century from the pocketwatch, its public acceptance in large part may be attributed to improvements in its durability. The early enemies of the wristwatch included water, dust, shocks and magnetism. It was primarily during the 1920s and ‘30s that engineering advances occurred in the fight against these forces. The wristwatches that we know and wear today are products of this evolution. Rolex and Omega, which today are leaders in the Swiss watch industry, pioneered the fight against water. While some cases were "well sealed" even before 1920, it was Hans Wilsdorf of Rolex who perceived an opportunity and, with astute marketing, made Rolex a world famous brand. In the early 1920s, a famous Swiss casemaker, Francis Baumgartner, made cases based on a patent by Borgel. The idea involved sealing the case by taking the middle part and threading it on both sides, rotating in opposite directions. The movement and dial then were fited within a ring that screwed into the caseframe. Several companies then used Baumgartner-made cases in the 1920s, including Omega and Longines. However, the Borgel-based cases did not seal well at the stem opening. To solve that, two Swiss watchmakers in La Chaux-de-Fonds, Paul Perregaux and Georges Peret, applied for a Swiss patent in 1925 for a screwed stem system. Wilsdorf grasped that a hermetically sealed case, together with careful fitting of the crystal and a special stem mechanism, would produce a better wristwatch. He quickly negotiated to have the Perregaux and Peret patent assigned to him. Wilsdorf then obtained a British patent on October 18, 1926. The Rolex Oyster became a commercial success. In 1927, a stenographer, Mercedes Gleitze, swam the English Channel with the unheard of accompaniment of a wristwatch –the Rolex Oyster— on her wrist for the entire 15 hour, 15 minute, swim. The ensuing publicity catapulted Rolex to a prominent place in the world of watches. The battle against dust and water had been won. Wilsdorf proclaimed "With this invention, originally made to increase the precision of the Rolex watch, at the same time the first waterproof wristwatch of the world was created. Like an oyster, it could remain in the water a indeterminate time before being damaged." In 1932, Cartier made a waterproof wristwatch, using a specially screwed crown. The Pasha of Marrakesh said to Louis Cartier " I would like to know the exact time while swimming in my swimming pool." The Pasha achieved his wish and Cartier may have created the first luxury sports watch in the process. Omega took a radically different approach. In 1932, it debuted the Omega Marine, a watch that basically had one case inside another. In 1936, an underwater researcher, Charles William Beebe, dove to the depth of 14 meters with an Omega Marine strapped to his diving suit. Before the age of scuba gear, Beebe succeeded wearing a huge helmet, weighted boots and tubes leading up to the surface, as well as his Omega Marine. During World War II, the world's militaries in practice distinguished between special diving watches and those having some water resistance. Divers needed heavily sealed cases and the idea of watches like the Omega Marine did not succeed. Instead, the idea was to have a large watch with a system to seal the crown and stem --the parts of a watch that were especially vulnerable to water. World War II Italian and German Navy divers adopted a different approach, using a well sealed watch that later had a special guard to keep the crown (and stem) flush against the case. Originally, the Panerai watches had unprotected crowns that used the Rolex screw-down mechanism. However, constant winding of these watches caused deterioration of water resistance. Officine Panerai solved the problem by a pressure-lever on the crown; those watches worked at a depth of 30 meters. Instead, most World War II forces –armies, navies and air forces—used watches that simply had well-sealed cases. The famous "WWW" --wristwatch, waterproof-- of the British forces really just used high quality cases that were well sealed. Many of these even had snap-on backs, rather than tighter screwed backs, like the IWC Mark X. There wasn't a perceived need for great water resistance. Even the legendary Mark XI, which debuted shortly after the war with a screwed back, had British military specifications requiring it to be water resistant to 10 meters. The ultimate evolution of more water resistant wristwatches may have resulted from clever marketing and a change in civilian lifestyles. In 1954, Rolex debuted its Ref. 6204 Submariner model at the Basel Fair: a dive watch for civilian use. The design was based on Rolex's Ref. 6202 Turn-O-Graph model and over the following decade evolved to look like the watch we know today. The Submariner became an instant success and an instant classic. The original Submariner, Ref. 6204, did not have Mercedes hands and had many other small differences from the current model. Two years later, in 1956, it was replaced with the Ref. 6538 --the "James Bond" Submariner, which was the first watch rated to a depth of 660 feet. It looked much more like the current model except that it did not have crown guards. Various other evolutionary changes occurred in the Submariner's design over the ensuing decades. There is some debate regarding whether Rolex produced the first civilian "dive watch" with its Submariner model. 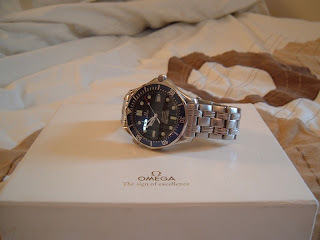 Certainly, it debuted a long time after the Omega Marine, but that model was not a great success and perhaps with hindsight can be regarded as a historical anomaly. But in the early 1950s the Submariner had a profound effect on the market. 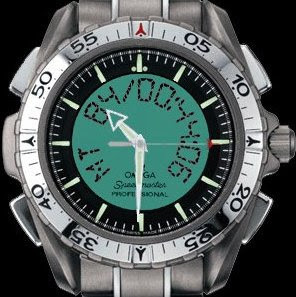 While not unique, the idea of a bezel that could be turned unidirectionally to tell elapsed time became identified with the "dive watch". There are claims that Blancpain, with its 50 Fathoms model, preceded the Submariner by a few months and was first used in a film made in late 1953. Blancpain successfully marketed its watch with Jacques Cousteau, the famous undersea diver, and later came out with its Aqualung and Bathyscaphe models as well. Blancpain also sold its 50 Fathoms watches for military use, as the German Navy model at right reflects. The success of these models can be attributed to being right for their times. Professor Picard in September 1953 descended to a depth of 3,150 meters in a bathyscaphe with a watch made by Rolex strapped to the outside of the capsule. Scuba diving was developed and rocketed in popularity in the 1950s. Omega debuted its first dive model Seamaster, the 300 (which had a water resistance to 200 meters), in 1957 and which used Omega's 20 jewel Cal. 28 SC-501 movement. 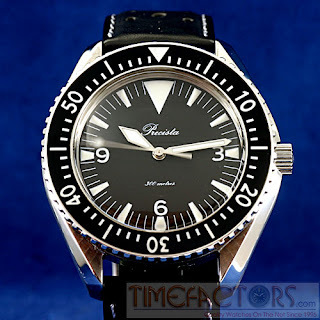 It redesigned the Seamaster 300 in 1965 and, following that model's success, then introduced many new models -- the Seamaster 120 in 1966, the Seamaster 600 in 1970 and the Seamaster 1000 (with a corresponding 1000 meter water resistance) in 1971. Even the luxury companies eventually followed suit, at least in their own way. In 1972, Audemars Piguet introduced its Royal Oak model, a luxury sports watch with a nautical theme and porthole design. Patek Philipe soon followed with its Nautilus: again a watch with a nautically-related theme, but certainly not a true dive watch. Today, water resistance is both taken for granted and perhaps exaggerated in importance. Extraordinary water resistance often is a badge of durability, but in a sense over-engineering arguably may be used as a marketing vehicle. Beginning in the 1970s, some wristwatches had water resistance ratings of 1000 or 2000 meters, yet it is impractical for any human to descend to anything close to such depths. 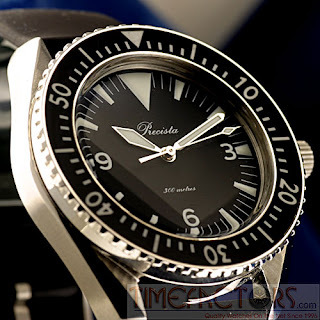 Dive watches continue to enjoy immense popularity. They are practical, sporty and fun watches. Matching contemporary lifestyles, their popularity is well deserved. Even out of the water, they subtly --perhaps subconsciously-- reinforce the idea of a casual lifestyle. My most recent watch ! See bellow for a review. The Seamaster Professional with reference number 2541.80 (quartz) was introduced in 1993. When the watch appeared in the movie "GoldenEye" on the wrist of James "007" Bond in 1995, it didn't take long for people to call it the Bond or "007" watch. In the following movies ("Tomorrow Never Dies", "The World Is Not Enough" and "Die Another Day",) Bond has used the automatic verson of this watch, the Seamaster Professional Chronometer, reference number 2531.80. The case diameter is of 41mm, the thickness is only 10mm (incredible for a watch this size), 47mm from lug to lug and weighs approx. 150 grams. The lugs are slightly polished SS and so are the crown guards, the rest of the case is brushed SS. The signed crown sits deep into the case, but is easily accessed and is of good size. The signed helium release valve is located at 10 o´clock and here is what it's used for: This Omega innovation is indispensable to divers who must spend several days in a diving-bell. A watch without a helium escape valve could explode from too much pressure inside the case when the diver returns to the surface. By unscrewing the crown positioned at 10 o'clock, the pressure is released through the valve without water infiltrating the case. The case back is beautiful, with the traditional sea-horse with the Seamaster wave pattern on the rest of the case, no useless writing like "Sapphire crystal" or "Tested Water-Resistance to 300m" or anything that doesn't need to be said. The serial number is situated under the 7 o´clock lug. Because of it's relative thinness and even balance of weight this watch is incredibly comfortable. The dial is fairly large, measuring 31mm. The hour and minute hand are skeleton style, and the sweep second hand is extremely smooth, having a dot of luminous material and the end is painted red, which makes it very eye catching. The dial reads Omega, Seamaster, Professional, Chronometer, 300m/1000ft. The date is at 3 o'clock and is black on white. The dark blue wave pattern on the dial is handsome and changes color at different angles. The bezel is uni-directional, as all dive bezels are. The sapphire crystal is slightly domed and has an anti-reflective coating only on the inside, which eliminates 50% of the glare and the crystal is easy to clean and doesn´t get scratched. The Seamaster Professional uses an Omega cal.1120 movement, based on the 2892-A2 movement with 23 jewels. The original ETA 2892-A2 has 21 jewels but after Omega modified it, it had 23. The rotor has the Omega cal.1120 engraving and a lot of the parts are nicely finished/polished. The movement is also chronometer certified. Which means that it has a certain accuracy tested by different temperatures and positions. -4 seconds / +6 seconds a day are the maximal deviations. The movement has a power reserve of 44 hours and ticks at 28.800 beats an hour. The date feature is quick-set and changes at midnight within a blink of the eyes. This movement can be found in many other high-end watches such as IWC and Ulysse-Nardin, it is very sturdy and has proven itself time and again. The bracelet is consisted of links made of 9 pieces, with polished SS highlights, it is very solid (and equally difficult to adjust). The bracelet comes with 2 half-links, that can be removed to make a perfect fit, since the clasp does not have micro-adjustment capabilities this is essential. As for the signed clasp, it is by far the best out there. It is solid to say the least, closes very well, but you must make sure that the diverís extension is properly closed, which can be tricky. It is powered by an exclusive decorated, rugged and reliable movement - the Omega 3220 caliber - which is different than the previous versions of this model, since they used to have the 1140 movement that lacks the desirable luxury finish. It has rhodium-plated finish, beautifully decorated with perlage (circular graining) on the plates, and Côtes de Genève (Geneva stripes) on the winding rotor mass and bridges. This movement, exclusive to Omega, is a slim 45-jewel self-winding Chronograph with central hour hand, central minute hand, small seconds at 3 o'clock, 12-hour totalizer at 6 o'clock, 30-minute totalizer at 9 o'clock, and central chronograph hand. The movement is of modular construction, based on the ETA 2892-A2 with the exclusive Dubois-Dépraz 2020 module. Power reserve: 40hours. This movement's dimensions are 30mm diameter by a height of 6.5mm. The high 28,800 beat-per-hour frequency (4Hz) make the small seconds hand at 3 o'clock as well as the central chronograph hand glide smoothly--noticeably smoother than on its big brother the Omega Speedmaster Professional which has a slower frequency of 21,600 beats-per-hour (3 Hz). This 39mm x 12mm Speedmaster case with its satin-finished sides and gleaming bevelled edges give it the distinguished sporty and desireable, sleek and immaculate appearance. This watch is related to the Speedmaster Professional in design with the same flat bezel style and the same combination of brushed and polished surfaces. It is essentially a reduced Automatic version of the Professional that will not dwarf your wrist, and instead of the hand-wound movement is fitted with a contemporary reliable and exclusive Omega Automatic movement. The Tachymetric bezel gives it the look of a precision instrument that it is. It comes in very handy for sportsmen wanting to measure speeds in miles or kilometers per hour and for entrepreneurs alike, as it can be used to. The back of the watch has the Speedmaster Horse medallion in relief and the intact serial number. The sporty bracelet is the newer type and is composed of 5 parts across, with the middle three being polished and the outer two brushed, providing a nice combination of shiny and matte surfaces that like giving an elegant play of lights. It has solid links and solid end-pieces that will not pinch hairs. 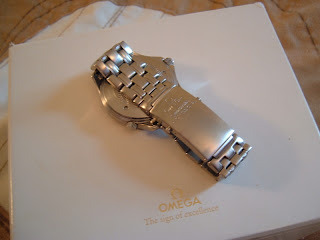 The clasp shuts very safely with a crisp click, and is signed with the Omega symbol and the title "Speedmaster." The matte dial has good luminosity at night: The white baton hour markers are coated with luminous material, and the baton hands are lacquered in white with luminous material inserts as well. The modular architecture of this exclusive movement gives it an unusually low profile by today's standards for automatic chronographs. For this reason the watch has the desirable status of being one of the slimmer chronographs and the slimmest Speedmaster with a profile of < 12mm. The other current Speedmasters are based on the popular Valjoux 7750 and 7751 movements, while the Speedmaster Professional--based on the Lemania movement all have a thickness of ~14.5mm. This watch is an excellent choice for those who want a handsome rugged automatic chronograph that will NOT dwarf their wrists. For that reason, this watch is adequately referred to as the "Speedmaster Reduced" since it has a 39mm diameter and a 12mm profile. This is a great watch! 2) Omega website lists the Speedmaster Reduced as having a 35.5mm case size, when it's actually about 39mm. Here is Omega's official explanation: "At the time the Speedmaster Reduced was launched the diameter was measured between 12 and 6 o'clock on the case body (without the bezel/tachymeter scale). This was common practice and we kept the dimension (35.5 mm) even for new Speedmaster Reduced models to avoid any confusion with the former versions." (info from John Rochowicz, at WUS). So, the correct sizes are the ones listed: 39 and 42mm.